More and more teachers are starting businesses as a way to subsidise their income, or even create a path to step away from teaching. For many, freelancing is the path they’ve chosen. Some indeed freelance and sell teaching resources together. Although it isn’t just teachers who are becoming freelancers, there are over 1/3 of the American workforce currently freelancing, and it is expected to rise to over 50%. I know this because along with loving my job as a teacher, I am also a freelancer looking for a way to create a business on the side. 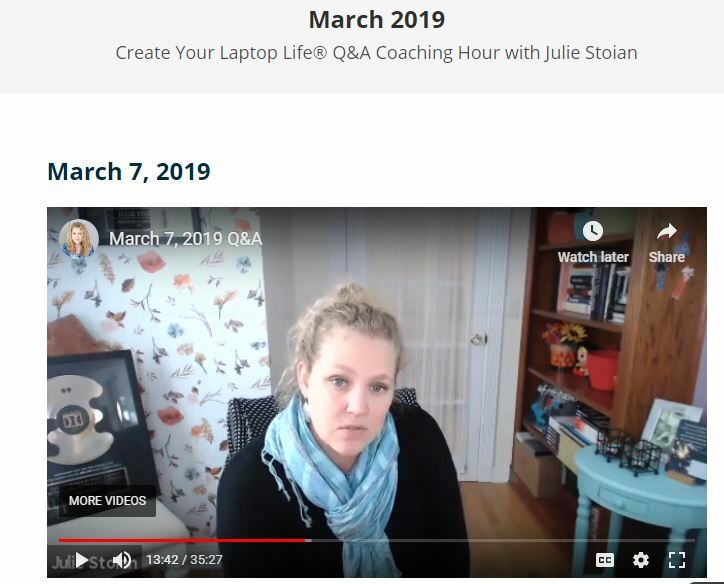 In this post, I am going to give my honest review of Julie Stoian’s Create Your Laptop Life (affiliate link) program, which I am a paying member. I will also show you how to get started for only $1. Even if you’re not a teacher, you will still get a lot out of this review…. I won’t try to make it too ‘teachery’ for you. You may have seen Julie promote her program through the free Freelancer Secrets presentation. Freelancer Secrets is a must-see 42-minute keynote from CYLL Julie at a Clickfunnels Funnelhacker live conference. The live presentation has been re-purposed as a free training guide for freelancers, which you can view here. ‘Zucker-booked’: Facebook marketing on auto-pilot. As a part-time freelancer, I took so much from this presentation and would recommend it to anyone. What is create your laptop life? Create Your Laptop Life is a membership community for startup online business owners and freelancers with already over 1000 members! The membership is perfect for you if you’re a freelancer trying to make your first $1k-$10k a month online and offers skills, strategy, and mindset to succeed as a freelancer. How does Freelancer Secrets work with Create Your Laptop Lifestyle? Basically, the Freelancer Secrets presentation is a free workshop that anybody can view. 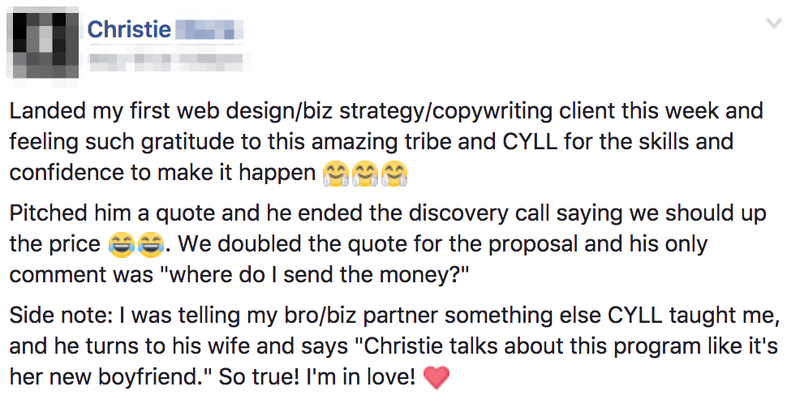 This presentation is a product of both Julie from Create Your Laptop Lifestyle, and Clickfunnels. Create Your Laptop Lifestyle is Julie’s flagship membership program where she gives over a thousand freelancers (me included) the tips and advice needed. What you get when you sign up to Create Your Laptop Lifestyle? The amount that you get when you sign up for Create Your Laptop Life through Freelancer Secrets is pretty damn impressive. There is a tonne of value on offer that is perfect for a freelancer like you. Here is a screenshot of the order page that shows everything you get and it’s value (not what you’ll pay) and I will break each part of the offer down afterwards. As a freelancer, I absolutely hate having to write up different proposals to clients. There is nothing worse than writing up a killer proposal for a potential client and getting nowhere with it. I’m sure you’d rather be focusing on client work. Sales Scripts for closing your leads within 15 minutes! Proposal Templates that you need to get a big YES from prospects. Real-life Examples to follow along and learn from Julie gives real-life examples of how she used the strategies to grow her business. Closing Strategies to help you close on both email and phone. I am going to be completely honest… I went into this process section expecting the same content that every other ‘freelance guru’ spews out. The proposal secrets section was a complete system to almost automate the way you get clients. Each section has a short video and PDF templates that give you all the tools you need to put together your proposals and attract the right clients. The proposal secrets section even gives you a way to make sure that your clients pay you for their proposal… so you’ll never have to write a proposal and hope for success again. As someone who struggles with Social Media marketing, this was a great section of the membership. Freelancer Secrets offers insight on how to use Facebook to grow your business. I understand the ‘how’ of social media, but I always struggled seeing how running social media as a freelancer day-to-day would look. In this 2-hour masterclass, Julie covers how she used Facebook every day to grow her business and use it as the top of her funnel. Lead Generation for people who aren’t ready to spend money on ads. USe the Facebook algorithm to get maximum engagement and reach. There are also some more generic sections of the masterclass, with post ideas to generate engagement quickly. 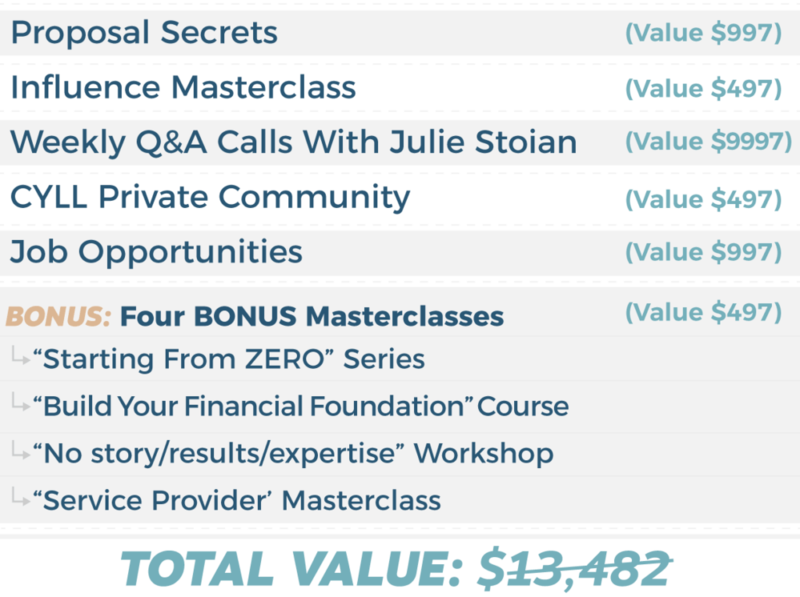 However, the real value in the masterclass is seeing real examples of how Julie used Facebook to grow her freelancing business. Okay, here is where the real value kicks in. Every week, Julie hops online for a live coaching call that is saved to the membership platform for future use and viewing. The live coaching calls are presented on Zoom and Facebook Live, and you can even submit your questions beforehand. While there is no set schedule for the calls (which isn’t ideal), there is always an up-to-date calendar that you can use for the calls. The live chats aren’t just some webinar selling something either, which I like. Each of the live calls I have listened to so far have offered a lot of actionable advice on almost everything freelancers struggle with from self-belief, to time management. The first thing I noticed when I signed up for Create Your Laptop Life, was a landing page which invited me to create an account along with an invitation to the private Facebook group. 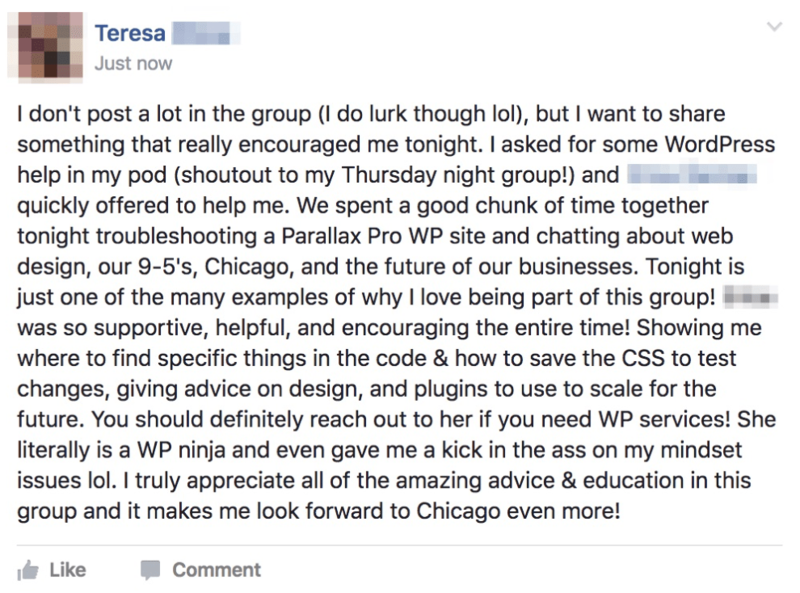 The private Facebook group is full of other freelancers who have signed up to the program. In the group, you can ask a question, get support, and you can even find jobs, as there are freelance opportunities consistently being posted. There is a messenger bot which you can sign up to for free, that will keep you in the loop every time a new job opportunity is posted on the group. My experience in the group has been really positive so far, with a supportive group of freelancers who I have already learned so much from. By having this group as a part of the membership, there is the benefit of only including other freelancers who have paid for the membership, this keeps the conversation grounded, and you can be sure that the people commenting on each post are legit and not someone loitering in a free group trying to sell you something. This is the add-on for the complete beginner! You can learn how to go from literally zero skills or idea about online business all the way to getting that first dollar. There are a range of other masterclasses and expert interviews that will keep you learning and excelling your freelancing career. 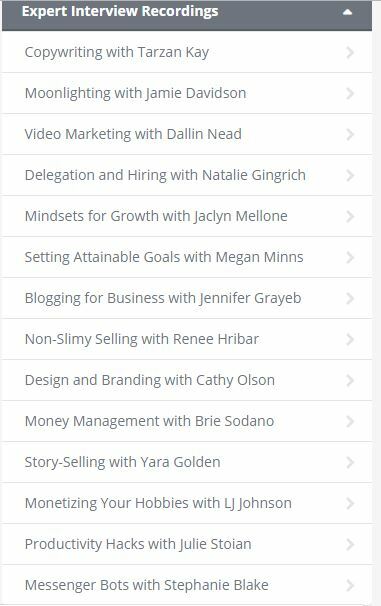 As you can see in the image below, these expert interviews cover a range of topics from goal setting, copywriting, money management, and many more. These interviews are consistently updated, so you’ll be able to keep learning as you go. Does Create Your Laptop Lifestyle work? One of the main questions that you’re probably asking about Create Your Laptop Life by now is if it works or not… and I can’t blame you. However, as is the case with any information product or resource, results will vary from person to person. While the marketing system and proposal funnel are great, it does require you to be actually competent in what you do. A big part of the proposal system involves a paid two-hour intensive call which is kinda like a coaching call with you and a potential client. Also, the fact that you’re conducting a two-hour call means that the process isn’t entirely passive, so what you put in will dictate what you get out. What I will say though, is that there is more than enough information in here to elevate your freelance business. I have begun using aspects of this system in my freelance work and am transitioning to completely using the taught processes in the coming months. How much does Create Your Laptop Life Cost? There are two different payment options for the Create Your Laptop Lifestyle membership. You can try the membership out for 14 days or only $1, which is pretty awesome. From there, you’ll pay $49 a month for unlimited access. However, if you want to go straight out and purchase a 12-month plan, you’ll only have to pay $199 a year. So, you basically get 8 months a year for free if you purchase the yearly option. Personally, I bought the $1 trial to suss it out for myself and ended up wishing I’d bought the yearly subscription. However, both payment options make sense depending on your circumstances. Do you need a clickfunnels account? 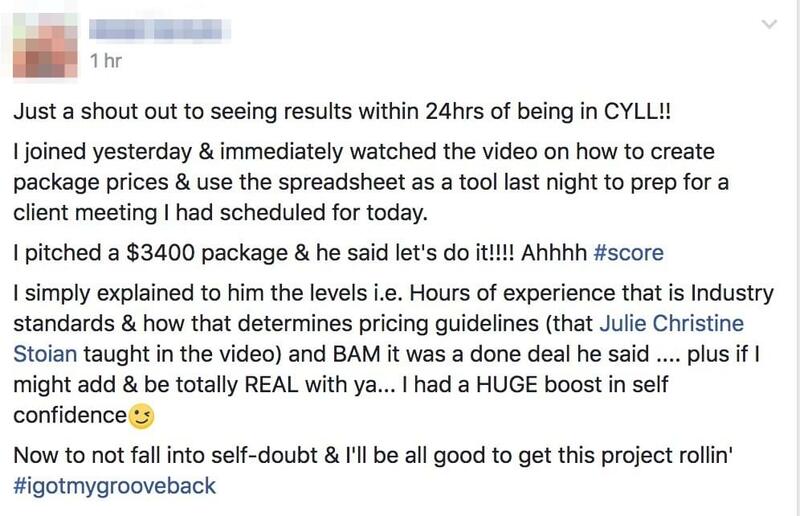 Julie from Create Your Laptop Life is working with Clickfunnels and mentions the platform a lot in her work. Create Your Laptop Life, nor do you need Clickfunnels to put into practice the teachings that are in the courses and workshops. While a Clickfunnels account does make it all easier, you can use the systems and hosts that you already use. If you’re a freelancer that is willing to put in the work to grow their business, you’ll 100% find that Create Your Laptop Life is worth the money you pay. If you’re looking for an easy way out and want to make money while you sleep, then you may need to go elsewhere. While the systems and funnels included are great and will make the process a lot easier, you still do need to put in work. The platform is only somewhat new too, and with new content coming up on the site every week, Create Your Laptop Life will be the ultimate guide to being a freelancer.